WBS element “Steel Fabrication” is the higher level of pipe rack fabrication and equipment access platform fabrication. The general arrangement drawing list, project area name, work pack number, fabrication start and finish date shall be included in the progress tracking sheet. You should have an additional spread sheet/system known as steel tracker sheet/system which includes the fabrication status of each assembly member for each GA drawing. 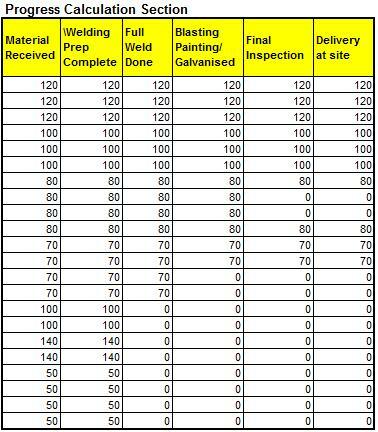 The progress tracking sheet is linked with the steel tracker sheet to update the fabrication status of each GA drawing. 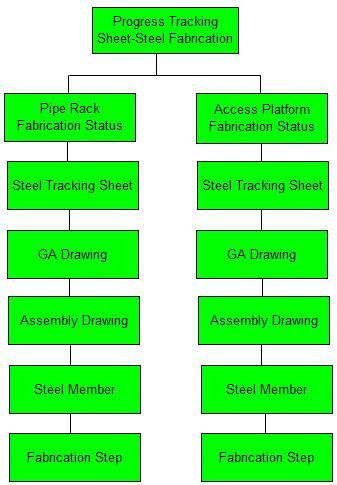 The following hierarchical structure represents how steel fabrication progress is tracked and monitored. It shows the level of progress reporting. I have developed a steel tracker sheet which includes progress updating section, progress calculation section and progress summary for each GA drawing. The progress updating section is used to update the fabrication status of each work step. It includes GA drawing description, drawing no, revision no, member type, weight of each member. For example, the steel fabrication of access platform for Air Cool Exchanger facilitates how the steel tracker sheet is developed. See table below. The progress calculation section is made to calculate progress status by means of weight. Once the actual date is updated for the particular work step, the progress (steel weight) is derived by using IF function. The actual dates of fabrication work steps are updated to understand how the progress is calculated. See table below. The table “Progress summary for each GA drawing” is linked to the table “Progress calculation section” to produce summary data using SUMIF function. This table will also be linked to “Progress Tracking Sheet-Steel Fabrication” to get high level progress status. To develop Progress Tracking Sheet for overall GA drawings, let’s make assumption that the Pipe Rack scope includes Pipe Rack A and Pipe Rack B for project area A and B respectively. The compressor platform, miscellaneous platform, Air cool heat exchanger access platform are included in area-A’s scope. Valve access platform, access platform for drum/vessel are included in area-B. The following work steps and weight factor percentages are utilized to develop the progress tracking sheet. Fabrication status of each work steps can be updated using summary data from steel tracker sheet. Calculation methods of the individual progress, overall progress, and progress summary data grouped by project area are the same as described in piping fabrication work. See table below. 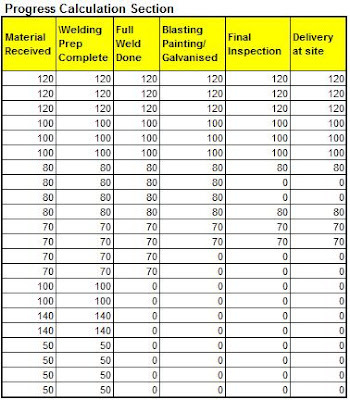 This tracking sheet is created using the same methodology as steel fabrication work. The work steps such as material at site, member assembly, final inspection and weight factors ( 5%, 85%,10%) are used respectively. It is a very interesting and helpful job you are doing. I hope everybody will participate. I want just to know if it's possible to publish similar sample calculations for other disciplines like process, civil, electrical and instrumentation works progress tracking systems. You are welcome. It will be published in future. how can i create this tracking sheet with the inventor program? for example with Acorn you can export information into an Excel spred sheet such as spool taging line specs ect. how can this be done through inventor? Thanks you so a such very informative blog. Its very helpful, but plz update latest posts frequently.